No matter where you live, what style of riding you do or what breed of horse you own, there are some things about being a horseperson that are universal. Club Horse member Hannah S. and her friend Kaley capture this equestrian culture perfectly in their video–we assume an homage to the classic SmartPak video–entitled “Things Equestrians Say.” Enjoy, and thanks for sharing, Hannah! 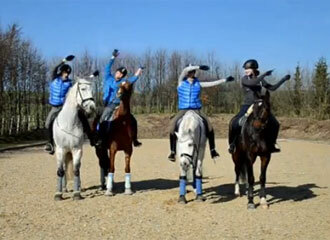 Who says dressage riders don’t know how to have fun? Hustler the pinto has no problem performing tricks as long as there’s a cookie involved. This made me laugh, love this! People who say riding isn’t a sport are just intimidated, because in OUR game the ball has a mind of its own.